Jefferson County Farmers Market Board Treasurer, John Estes, passed away Sunday, March 24th at his home. He served on the Jefferson County Farmers Market Board of Directors for 15 years in the role of Treasurer. Aside from good financial management, John brought a dry sense of humor and a kind smile to the market board. A Texan by birth, John was devoted to serving his Jefferson County community as a Farmers Market Board Member and member of the Sunrise Rotary. He and his late wife, Sue Estes, loved and cared for a crew of cats and dogs as well as volunteered for the Jefferson County Humane Society. Our deepest appreciation goes out to John for his hard work on behalf of the Market. John will be dearly missed by our market community. Opening Day 1 Week Away! 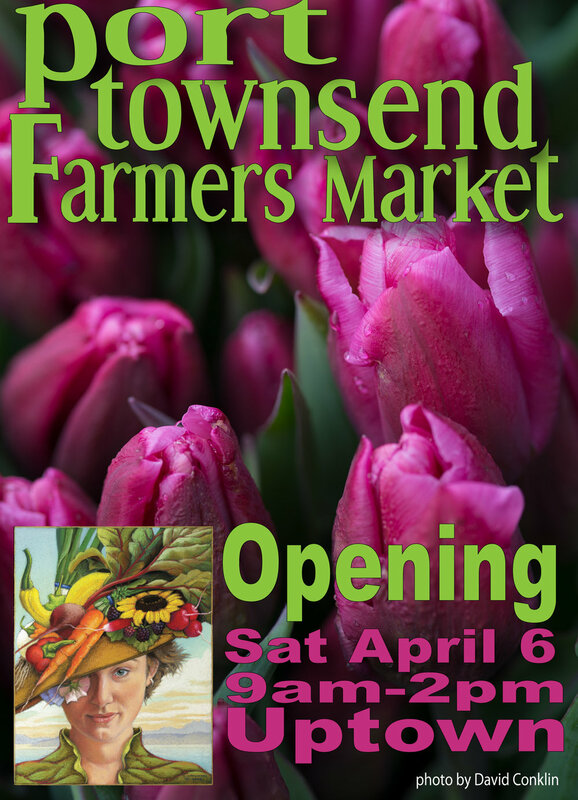 The Opening Day of the Port Townsend Saturday Farmers Market is almost here! We only have one more week to go! Get your goats and market day hat ready! PTG Creations: Artist Tiffany Griffin of Port Townsend is joining us with dream catchers. She writes, "These aren’t your ordinary store-bought dream catchers. I design and handcraft all my dream catchers. Each dream catcher is hand-woven or crocheted, each added delicate detail, like the black walnut wood accents, are locally purchased and are personally cut and sanded. These pieces make for gorgeous home décor." Suzanne DeMasso Designs:Artist Suzanne DeMasso of Port Hadlock will be vending one-of-a-kind earrings, pendants, and bangle bracelets. A welder, she will be making jewelry at the market giving customers a chance to see pieces come to life. Suzanne uses mixed metals, brass, copper and sterling silver, as well as "precious findings that are timeless." Three Peas Farm: Farmer and chef, Amy Poteete, of Port Townsend will offer nettle tea, healthy fruit smoothies, as well as fresh eggs. Smoothies feature fruit from the five-acre permaculture Three Peas Farm and intentional community. The nettles and chickens thrive on their woodland property located close to Four Corners. We are seeking volunteers to assist with market setup and breakdown for our Port Townsend Saturday Farmers Market. We also have a few special event and office tasks in need of volunteers. If you are an early morning person and like to get moving, consider joining our small team of volunteers. Volunteers join Amanda in hauling and setting up tables, chairs, and market tents starting at about 7am. Breakdown volunteers assist with the process in reverse when the market closes at 2pm. This is a fun workout that provides a great opportunity to meet market vendors as well as see the market behind the scenes. Interested in volunteering with the Jefferson County Farmers Markets? Contact Amanda Milholland today! Info@jcfmarkets.org, 360-379-9098. Cora, Mystery Bay Farm, Opening Day 2018. Photo by David Conklin.